Echo Pictures - 98 min. Cast: Phillip Gordon, Alison Routledge, Max Cullen, Jim Moriarty, John Ewart, Grant Tilly, Jenny Ryken. Crew: Screenplay: Arthur Baysting, John Day (based upon an original story by Simon Willisson); Photography: Kevin Hayward; Editor: Simon Clothier; Music: Clive Cockburn; Producer: Trishia Downie; Director: John Day. A successful city lawyer abandons his practice and heads out to the country. There he comes upon a stately, but neglected, homestead. He moves in, and during his first night a beautiful ghostly woman makes love to him, in his sleep. Soon his dreams become more engrossing than his everyday world and girlfriend. Gradually he unravels the tragedy of his spirit lovers' past. To respond to her call, he needs to embrace the hearafter. 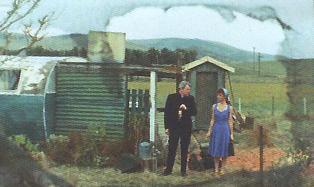 This photographically beautiful story was mostly filmed in the Otago countryside around Tapanui. Although vhs pal versions exist, as of January 2011, there are no known reseller sources. As of 25 November 2007 - An R0 PAL DVD became available from Spanish sources. It is presented in is original 1.66:1 format with its original 2.0 dolby digital English soundtrack, plus a 5.1 Spanish track and optional Spanish subtitles. Additionally there is Spanish text, cast, crew and film synopsis. It usually is selling for under 15eur for new copies. Starting 20 June 2011, a PAL R0 version was released in New Zealand. This bare-bones issue was selling from NZ suppliers for about $15nz, but as of February 2015 it seems to be OOP. If you reside in New Zealand, you can rent it from Aro Video, who will ship countrywide.